Manny Pacquiao had barely won his latest world title, at a seventh different weight, in Las Vegas in the early hours of this morning when the boxing world turned its attention to the next challenge facing the Filipino many were prepared to call the "greatest ever" after his stunning victory over a brave but outclassed welterweight champion, Miguel Cotto. "We want Floyd,'' chanted the crowd in the 16,000-seater arena at the MGM Grand casino. "I want Mayweather," said Freddie Roach, the trainer credited with transforming Pacquiao from a good boxer into a great one. "Mayweather's people know who to call. They've got my number," said Pacquiao's promoter, Bob Arum, who has been around the boxing business since the halcyon days of the 1980s but was still prepared to make a bold claim on behalf of his client: "I would go on record as saying that Manny is the greatest ever, better than Ali, Marvin Hagler and Sugar Ray Leonard." The only voice missing from the choir was that of Floyd Mayweather himself. Bedevilled by financial problems, the unbeaten American welterweight recently returned to the ring and, despite his reputation for having an over-cautious approach to choosing his opponents, it is hard to see how he could sidestep a contest that could conceivably surpass the hype. As always the money men will have the final say. "Benjamin Franklin [the former US president whose face adorns the $100 bill] is the most important personality," said Ross Greenberg, the head of sport for the US television network HBO, which broadcast Saturday's contest into American homes. "Franklin's face brings people to the table. Each guy needs to look at the big picture and the big picture is a boatload of cash and a fight too important for the sport." Negotiations for a fight between the Filipino and the undefeated American will begin tomorrow. They will be hard-nosed and probably acrimonious but Greenberg is right; the appetite for a meeting between the two best boxers in the world is too great and so are the rewards. It will happen in Vegas, sometime in the new year. The only remaining uncertainty is the identity of the eventual winner. Despite Pacquiao's two previous victories, over Oscar de la Hoya and Ricky Hatton, there were some who doubted his talents, or at least his chances of defeating Mayweather, who is the naturally bigger man. However, the Filipino's performance yesterday in stopping Cotto in the 12th round erased all such doubts. Many prominent figures, including the likes of Hatton, had picked the Puerto Rican as the potential winner, believing he was too big and strong for Pacquiao, who fought his first fight in the 106lb weight division – over three stone below the limit – for yesterday's contest. Yet within four rounds Cotto had been on the floor twice. His face was bloodied and his repertoire of moves exhausted by efforts to avoid his opponent's punches. By the time the referee, Kenny Bayless, halted the fight midway through the final round Pacquiao was so far ahead he was almost in the next state. 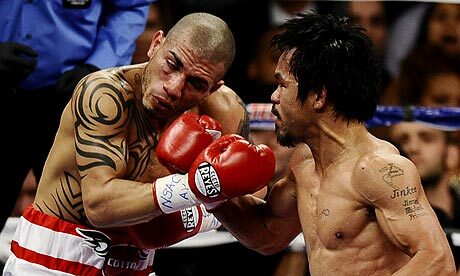 The only blemish on a well-nigh perfect performance was the first round, which all three judges awarded to Cotto. "Manny fought Cotto's fight too much in the beginning. He stayed on the ropes too long. But as the fight went on, Manny's speed was too much for him," Roach said. Cotto was taken to hospital for precautionary reasons while the champion headed off to a casino where he was to perform a set of eight songs with the house band. "I'm just ordinary," Pacquiao said when asked to assess his talents. As a singer he may be. As a fighter – on the evidence of this performance – he could not be more wrong.